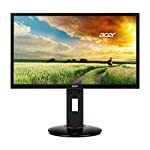 You might not have heard of Eizo before, they are not necessarily a well known brand but that doesn’t mean you shouldn’t research their monitors. 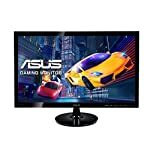 In fact they have been putting out monitors aimed at gamer’s discerning needs for a while so you can expect to find some game ready monitors in their inventory. The Eizo Foris FS2434 is a 60Hz IPS screen with a number of features that should appeal to the gaming community. The first thing you’ll notice are those lovely slim bezels encapsulating the screen. I’m a fan of thin bezels, they are great with multi monitor setups and I always prefer having two or more screens. But even if you have one, they still just look better! At just 6mm on the sides this really does lend itself to a triple mounting though. Even though this isn’t an uncompromising gaming monitor, you still get a red strip to know that it’s gaming credentials aren’t fully lost. The base rotates and allows around 60cm of height adjustment. A carry handle is present if you like moving your monitor around, attending the odd LAN party perhaps. USB 3 and headphone sockets are available, along with not the greatest pair of speakers in the world. The Enzo also comes with the very smart G-Ignition system. If you’ve been frustrated by onscreen menus and unresponsive buttons you’ll love setting up your monitor with this. Once you connect a monitor up using a USB cable you can use the supplied software on your PC to configure the setup as you wish. If you have multiple monitors these can be daisy chained from one to the other using additional USB cables. A remote is also supplied so every angle is covered. The Eizo Foris FS2434 features an IPS based panel, known for their colour accuracy and superior viewing angles. With a 5ms response time this has also been optimised for gaming, this is about as fast as an IPS screen gets. Professional reviews show good accurate colour reproduction although highlight a slightly lower than expected contrast ratio given the IPS panel. The blacks could also be darker. Overall image quality is still excellent and suitable for graphics work as well as looking gorgeous in games. With no adaptive sync and a 60hz limit you might want to look elsewhere if you are looking for the perfect gaming monitor. We give the Eizo Foris FS2434 a 4.5 out of 5 rating. Want to know what existing owners of the monitor think? You can read real user reviews here. Should I buy the Eizo Foris FS2434? 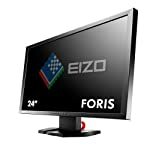 The Eizo Foris FS2434 is a responsive monitor suitable for gamers after an IPS screen. That said, it does not include adaptive sync tech and runs at a max of 60hz. If you want to go all out you'll need to look at alternatives. If you are having some doubts about this purchase then why not read some real owner reviews and see what other buyers think.